Participants: Estella Burga, Tova Fransson, Sepidar Hosseini, Lera Lerner, Johanna Norrbin, Anna Öman, Svetlana Polyanskaya, Ksenia Remezova, Anna Tereshkina, Timofey Tkachev. According to UN Population Fund, in 2014 the population of young people between the ages of 10 and 24 had hit 1.8 billion, being the largest youth population ever in the history of humanity. That means that global society is changing and getting younger and in some countries young people make up a majority of the citizens. Nevertheless, their participation in sociopolitical processes is often minimized, they are excluded from decision-making on societal level and their rights, hopes, and dreams often remain outside the political discourse as well as list of priorities. On the other hand, certain industries and spheres of life have recently become ‘younger’ due to influence and presence of young people. These are not only technology and entertainment industries, where young people often feel more comfortable and where their skills fit better, but also media, politics, arts and science. Here, their ideas and perspectives on the past, present and future of the global society, that can bring positive and often necessary change, are essential for its sustainable development. Understanding the important role of young generations for a society’s future, Fast Forward to the Future will focus on analysis of youth policy in Russia and Sweden, governmental strategies of work with young people and possibilities for younger generations to participate in social processes. Project initiators would like to push ‘fast forward’ and create possible scenarios for intercultural relations between young people who live in neighboring countries and share their political, social and environmental future now. Very soon they will become decision makers in their countries and the experience of establishing a dialogue with their peers in other countries will broaden their horizons and perspective on global processes. 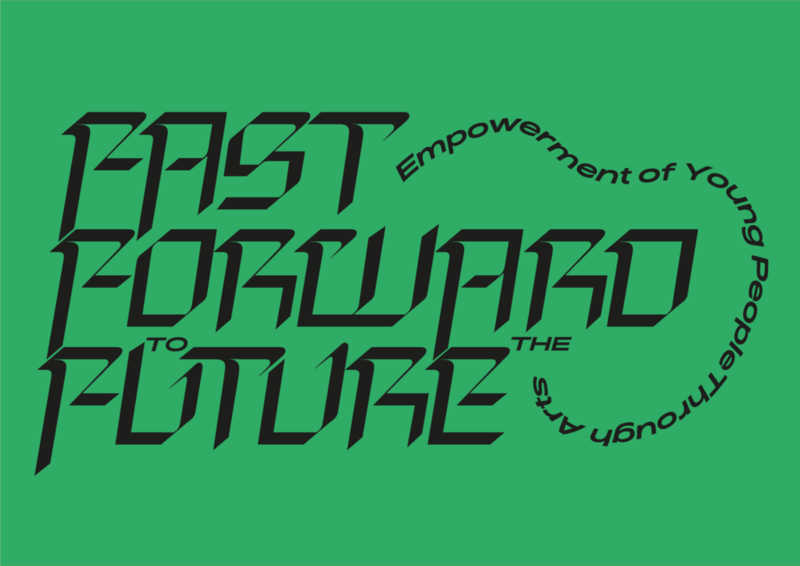 Fast Forward to the Future initiated by Grafikens Hus (Södertälje, Sweden) and TOK is a polyphonic platform where young people can express their opinions about the themes that they find important and engage into a public discussion with people of different ages and background. Invited participants – artists, performers, journalists and educators – help them use various artistic formats for that- from large-scale posters, zines and videos to sound installations, performances and public actions. Printmaking has been dubbed the most democratic of visual art forms. Because of the multiplicity inherent in the medium, prints have played a unique role throughout history in recording and disseminating information; in propagating new aesthetic movements and styles; in spreading alternative political thinking across ideological and national boundaries and in facilitating public dialogue. Methods of printmaking runs as a red thread through the project. Printmaking will be explored by the groups of young people for the opportunities it offers for innovation and experimentation through multiples, its reach to a wide and disparate public. The idea is to support young people in obtaining and strengthening their voices in the public realm. We encourage them to speak openly about their future and their role in the society as well as the legacy of older generations they have to deal with, be it culture, politics, gender roles, or the state of the planetary resources. High speeds and information overload fuel the competitive race among people that requires a lot of energy and self-confidence and might lead to stress, burn-out, and depression which rate is becoming very high among young people today. In that context, the idea of a safe and creative space open for off-line discussion and actions sounds like a solution for relieving tension and exchange with other people using art as a medium and supporting the idea of ‘art for all’. The project also has an educational aspect, which targets professionals working with young people and aims at horizontal knowledge and practices exchange between them while collectively planning the project activities. Together these professionals will create and test several formats of provoking young people exploring new experiences, dialogue and actions that can be adopted by (art)educators in different countries and societies. The team of Fast Forward to the Future consists of curators and participants from Sweden and Russia, who have previous experience of working with young people at the territory of art and would like to enhance their knowledge and be a part of an international network of professionals focusing on cutting-edge art and social practices. Fast Forward to the Future lasts for two years and takes place in St. Petersburg, Stockholm and Södertälje. The first year is dedicated to research and planning. Both the Russian and the Swedish parts of the team travel to Sweden and Russia, correspondingly. During these trips project participants get familiar with the structure of youth organizations, youth unions, art institutions targeting young people, they also meet local artists, performers, directors, and educators who run initiatives and projects for and with youths. In between and after the participants, divide into three groups and aided by curators, develop the ideas for collective workshops in collaboration with local project partners – youth targeted organizations or existent collectives of young people. During the second year, the workshops are conducted in the format of a Festival both in Södertälje and St Petersburg that are targeting small groups of young people and wider audiences of different ages. A short documentary about the workshops and the Festivals will be produced to illustrate the activities and visualize the experiences and emotions of their participants. Final bilingual publication will be an integral part of the final outcome of the project. It will serve as a theoretical reader and will include texts by invited experts and will outline the practical results of the creative and educational workshops. The publication will contain a list of recommendations for the development of different creative and social methods of enabling young people to take creative action through arts. In Södertälje the Festival will focus on two main interconnected themes – the future and its potentiality and emotional and mental perception and exploration of the city of Södertälje, which is ethnically diverse despite its small size. During the workshops conducted by the three groups, participating young people will create their own ‘youthopian’ narrative, map out their urban experiences and test their power to change the city space using art.